Quite some time ago, we featured the D&G Test Card Watch, and now we’ve come across a similar timepiece for your wall in the Nextime Test Page Clock. 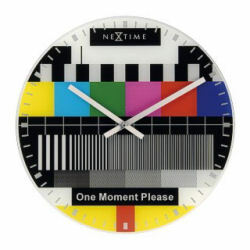 As with the wristwatch, it features the brightly coloured design famous from the early television test card. It also has the words ‘One Moment Please’ written across the bottom for added early viewing authenticity. It costs just under £32 from Corvus Mail Order.